File photo (he's clearly not on a plane). 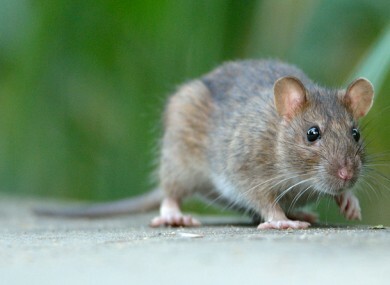 AIR INDIA HAS been forced to ground one of its planes after crew spotted rats scurrying around the cabin, The Times of India reports. With unwelcome similarity to a certain film, the plane was on its way from New Delhi to Calcutta when staff became aware of the dozens of unwelcome guests (and who presumably hadn’t checked in, or even bought tickets), the paper said. “Rats on board an aircraft can lead to a catastrophe if they start chewing up electric wires,” the paper quoted an unnamed airline official as saying. If that happens, pilots will have no control on any system on board leading to a disaster. No one at the airline was immediately available for comment, but an Air India official speaking on condition of anonymity said rats on planes were a “common phenomenon” worldwide and could “get in anywhere”. Ew. “They follow the catering vans into the plane when they smell the food,” the official told AFP. It is not the first time that India’s loss-making carrier has suffered a rodent infestation. Fears have grown recently over the safety of air travel after two crashes and one disappearance. However, if you stomach this and catch a flight, you only have a 0.0004% chance of being in a plane crash. The number of crashes have fallen in recent years. - © AFP 2014, additional reporting by Nicky Ryan. Email “Rats On A Plane: Rodent infestation grounds Indian aircraft”. Feedback on “Rats On A Plane: Rodent infestation grounds Indian aircraft”.